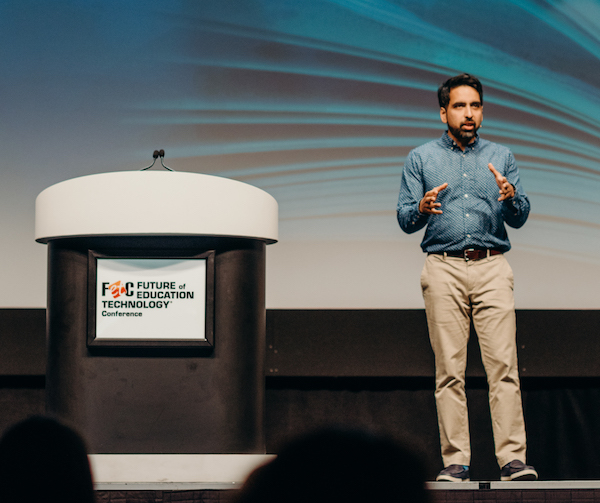 Khan, who currently teaches humanities and sciences at the Khan Lab School in California, delivered the keynote for the 2019 Future of Education Technology Conference in Orlando. The following is an edited excerpt from an exclusive interview. Your idea of education in the future is very different from conventional schooling. It’s an environment where software is instrumental in tracking student progress, letter grades are eliminated and students engage regularly in creative work. The classroom is interactive and hands-on, too. How can district administrators move in this direction? It’s taken me and the Khan Academy longer to realize this, but not everyone can easily move to a mastery-based, self-paced learning environment. That’s hard to do overnight. We have a bunch of efficacy studies for that type of model, and they’re really robust, but change is hard. More recently, we’re seeing that if students put 30 minutes to an hour per week—or one class period per week—toward software-based, self-paced learning, schools will see a 20 to 30 percent greater-than-expected gain on state assessments. That’s exciting because that’s a dosage that’s very doable in mainstream classrooms. We tell schools to give students 30 to 60 minutes of Khan Academy per week, with teachers doing traditional curriculum four days per week. You’re going to see a pretty dramatic improvement. You’ll get the best of both worlds. Technology is critical to this concept, but to increase student achievement, you also propose no-tech solutions, such as peer-to-peer mentoring and one-on-one coaching with teachers. How can educators realize this vision? A lot of this stuff has nothing to do with technology. Concepts such as reimagining summer breaks to resolve some of the problems that summer vacations create doesn’t require technology. The big idea in the book centers around letting every student learn at their own time and pace, having differentiation, and requiring mastery of concepts before moving on. Once this model is in place, it unlocks what happens in the physical classroom—you get more human time and interaction between students and teachers. Let’s shift to assessments. You don’t want to eliminate standardized testing, but you do recommend changing the content every year and including richer tasks such as open-ended questions. How can technology be leveraged to improve assessment and limit the appeal of test prep? Assessment is not inherently bad; you need some type of measuring stick. The problem is that you’re only measuring one dimension of a student with conventional assessments. It’s important that test results are kept in context. With the traditional standardized test, it’s about how a student performs in that moment. But something like Khan Academy can determine how they engage with a task over a long period of time. It can also help gauge a student’s resilience, grit and how they react when getting a wrong answer. 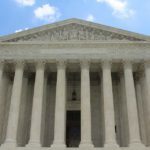 If Khan Academy can start taking on some of the foundational practice and instruction, it should hopefully liberate the teachers and class time to do more higher-order tasks. Khan Academy can help teach the more traditional concepts and skills, so teachers don’t have to assign and grade them as much. You also believe an important element of education is providing opportunities for students to engage in the arts, including music and robotics, and to measure a student’s creativity. Have your views changed since launching a school? One of the reasons why we started the Lab School was because it’s one thing to write about it, and it’s another thing to experience it. It’s all about creating space for creativity. Now that I run a school, I see that some of the stuff is not as easy to accomplish compared to how it sounds theoretically. None of my views on the ideas have changed, but the hardest part is mindset change because you have a lot of incredible teachers who have had so much put on them for so long. And students who have been in a traditional education model have been told—and almost forced—to do things. Both have been stripped of their freedom to create. What changes would you make as a public school district administrator, state education chief or U.S. secretary of education? What policies would you enact to develop a system that supports a self-paced, technology-enhanced learning environment? At the superintendent level, I see it as creating positive incentives for classrooms that engage in this type of mastery-based learning model. As a superintendent, I would give more exposure and allow those educators to become leaders. I would also show that it’s not either/or; you can do traditional coverage of subjects and also differentiate instruction one or two days per week. As a state superintendent or secretary of education, I would give districts flexibility and permission to reallocate resources toward technology and professional training. At the federal level, I would create models where students can prove their competency and be recognized anywhere in the country. That would be a pretty big deal because everything would move naturally to a mastery-based model. Where do you see your nonprofit heading in the next five or 10 years? A big focus right now is in partnering with districts. 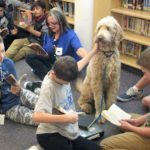 They love the resources, but want training and support with instruction, and integration with student information and learning management systems. Also, we already have a strong emphasis on math from kindergarten through high school calculus, and we just launched an early learning app as well as SAT prep. Next year, we’re going to pilot English language arts. I hope in five years we can start developing a global credential that would prove a student’s knowledge and create recognition for students anywhere they go. Gov. Gretchen Whitmer’s first budget recommends an additional half billion dollars for Michigan schools, including as much as a $180 boost in per-pupil funding and extra funds for low-income and special education children. It also allocates money in what amounts to a “weighted” system.